Lasmiditan, a novel serotonin receptor agonist, was found safe and effective in adults with acute migraine with or without auras and who were at high risk for cardiovascular disease. A phase 3 SAMURAI trial of lasmiditan, a serotonin receptor agonist that targets 5-HT1F receptors without vasoconstriction, found the drug was effective and well tolerated for acute migraine among patients at high risk for cardiovascular disease. The study found that significantly more patients who took lasmiditan (at 100 and 200 mg) were free from headache pain and such symptoms as nausea, phonophobia, and photophobia at two hours after treating a migraine attack. Lasmiditan selectively targets 5-HT1F receptors, including those expressed at the trigeminal pathway, and it has been designed for the acute treatment of migraine without the vasoconstrictor activity associated with some migraine therapies, explained Kraig Kinchen, MD, senior medical director of migraine and related therapeutics at Eli Lilly and Company. The study was sponsored by CoLucid Pharmaceuticals, Inc., a wholly owned subsidiary of Lilly. Dr. Kinchen noted that the investigational, oral, selective serotonin 5-HT1F agonist is “structurally and mechanistically” distinct from other approved migraine therapies, such as triptans, which can have vasoconstrictive effects resulting from activity at the 5-HT1B receptors. Triptans are contraindicated in patients with cardiovascular disease, Dr. Kinchen said. In the current phase 3 trial, the researchers intentionally enrolled patients with cardiovascular risk factors. The randomized, double-blind, placebo-controlled study was published in Neurology on November 16, just two days after Eli Lilly announced its submission of lasmiditan to the US Food and Drug Administration (FDA) for the acute treatment of migraine in adults with or without aura. Independent experts who reviewed the study said they welcomed the treatment option for patients at high risk for cardiovascular disease. But they also noted that the drug did have other related side effects, which some patients may not find tolerable. The researchers, led by Bernice Kuca, BA, MS, head of clinical and regulatory operations at CoLucid, tracked 1,856 adult patients with a diagnosis of migraine with or without aura who had three to eight migraine attacks per month and moderate disability, as assessed by a Migraine Disability Assessment score greater than or equal to 11. Patients with cardiovascular risk factors such as age, total and high-density lipoprotein cholesterol, systolic blood pressure (including treated or untreated status), diabetes mellitus, and current smoking status, were intentionally enrolled in the study. Those with known coronary artery disease, clinically significant arrhythmia, or uncontrolled hypertension were excluded. A total of 83.6 percent were women, the mean age of the participants was 42 years, and 82 percent had both migraine and at least one cardiovascular risk factor. In the 11-week study, the team randomized patients to a double-blind dose of oral lasmiditan 200 mg, 100 mg, or placebo, and asked patients to treat their next migraine attack within four hours of onset. Forty-eight hours after dosing, patients recorded their details regarding any headache pain and the presence of nausea, phonophobia, and photophobia. Patients who received lasmiditan at 200 mg and lasmiditan at 100 mg versus placebo were pain free from headache at two hours after the first dose (32.2 percent and 28.2 percent versus 15.3 percent, respectively; p<.001 for both doses), and were free from other self-reported bothersome symptoms (40.7 percent and 40.9 percent vs 29.5 percent, respectively; p<.001 for both). Overall, patients who received lasmiditan at either dose reported headache relief compared with those taking placebo (59 percent vs 42.2 percent, respectively; p<.001). Commonly reported side effects with lasmiditan (≥2 percent and greater than placebo) after the initial dose were dizziness, paresthesia, somnolence, fatigue, nausea, muscle weakness, and numbness, with events ranging from mild to moderate in severity. He noted, “If I had a patient [who] was worried about cardiovascular risk, even if they tried triptans or not, they might gravitate towards this product. It also depends on the side effect profile.” For example, he said, patients may say they don't like paresthesia, and chest pain and neck discomfort [side effects of triptans], which might cause them to avoid triptan medications. “They may say, ‘I'll take my risk of 15- to 20-percent of dizziness,’” which is a side effect of lasmiditan. “The patient will choose the kind of drug they prefer based on the side effect profile,” said Dr. Martin. Nasim Maleki, PhD, a migraine researcher and assistant professor of psychiatry at Massachusetts General Hospital, said the study provides a new alternative to a population that would otherwise heighten their risk of cardiovascular events with triptans. “The big positive of this drug, which is very exciting, is that patients who were not able to take triptans because of cardiovascular indications now can go on something that helps,” she told Neurology Today. A triptan arm to the study would have been helpful to compare the safety and efficacy of the two drugs in a subset of patients with no cardiovascular indication, however, Dr. Maleki said. Both Dr. Martin and Dr. Maleki questioned the researchers' inclusion criteria regarding cardiovascular risk factors. Dr. Maleki found the study unclear as to what level of presence of cardiovascular risk factors or severity of cardiovascular diseases would be appropriate for prescribing lasmiditan. Dr. Kitchen is an employee at Eli Lilly and several study investigators reported disclosures relevant to the study in the full paper. Dr. Martin reported relationships with Eli Lilly, Allergan, Promius, Avenir, Amgen, Teva, Biohaven, and Alder. Dr. Maleki reported no relevant relationships. •. Kuca B, Silberstein SD, Wietecha L, et al Lasmiditan is an effective acute treatment for migraine: A phase 3 randomized study http://n.neurology.org/content/91/24/e2222. Neurology 2018;Epub 2018 Nov 16. 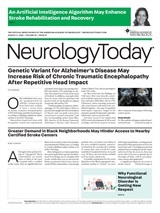 Neurology Today19(2):1,22-23, January 24, 2019.